Former MLBer Mat Latos hasn’t pitched in the bigs since getting released by the Blue Jays in May of last year. He’s now with the New Jersey Jackals of the independent Can-Am league, and on Saturday he was right in the middle of a bench-clearing brawl. That’s Latos in the GIF above, hoisting an opponent for what looks like nothing so much as the classic Hart Attack finisher. 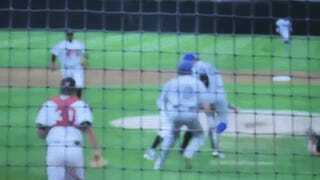 In the sixth inning of a game against the Rockland Boulders (great team names both), a collision at the plate led to benches clearing and a lot of milling about, but no punches ... yet. Latos came inside on the first pitch the next batter. The pitch after that sailed over the batter’s head. That’s when the fisticuffs happened. Both Latos and Ryan Deemes, the Rockland reliever who first charged the mount and ended up in Latos’s meaty clutches, were ejected. Latos, 30, is trying to work his way back to the majors, and has a 5.14 ERA in 21 innings with the Jackals.